Graze at Clink Restaurant in Sumner Village! As the nights start to cool and the lights are getting turned on earlier, we decided it was time for an early dinner special. 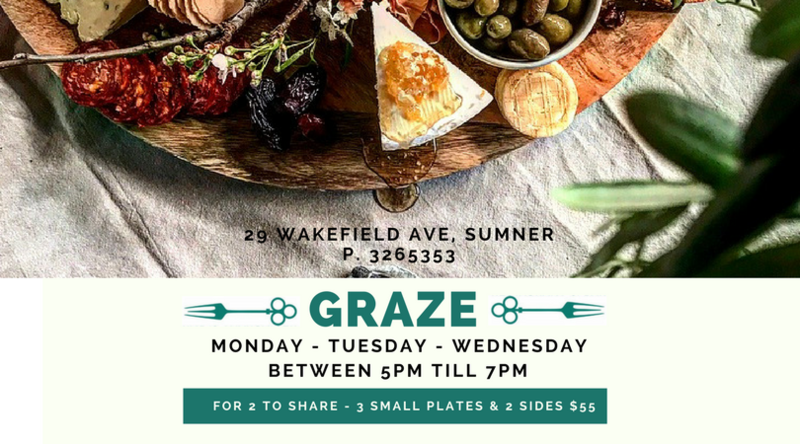 Graze is available from 5pm till 7pm Monday to Wednesday. We think our small plates are pretty special and the sides are scrumptious so add them all together and you can graze on a little feast! Bookings are recommended – so head over to our BOOKINGS page to secure your table! We’re not quite ready for the warm temperatures of Summer to be over however the dewy morning grass is getting us thinking about food and beverages that reflect the change in the air. Personally I LOVE change of seasons to get inspired and with places like Pinterest and Instagram feeding our minds with beautiful pictures and endless ideas it’s easy to get excited. Pop over and have a look at what’s feeding the Clink Teams imagination. We’ll be trialling out new season flavours with our Trust the Chef and cocktail of the week specials as we work on our Winter menus so be sure to check out what’s happening over on our Facebook page every Wednesday for what we are serving up.